Lana Del Rey was spotted out and about in West Hollywood on August 29th, 2016 in one of her go-to blue jeans and white t-shirt looks. On the beginning of February 2017, Lana Del Rey took over her Instagram account to show everyone how she does her morning makeup. With over 2 million views, lots of fashion magazines have been reporting this video as a real inspirational trick for your eyebrows. On November 13th, 2012 Lana Del Rey sat down with JustJared.Com and had an exclusive interview at 102.7 KIIS FM Radio Station in Los Angeles, California. She also performed an acoustic session of Ride , while she was there! Del Rey wore a White Shirt, Denim Blue Jeans, and Red Shoes. Her iconic Blue Jeans and White shirt can be found with details and link to get an inspirational look. To read the interview click here . On July 19th, 2016, Lana Del Rey performed at the Rockwave Festival in Malakasa, Greece along side her backup dancers while wearing a Baby Blue Dress, White Belt, and White Sandals. Here is an inspirational look followed by details, links and prices! Lana Del Rey was seen at LAX Airport on June 1st, 2016 where she was boarding her flight to Poland where she would be performing at The Orange Warsaw Festival on June 3rd. Del Rey wore a yellow top followed by a beige scarf on top with some blue jeans, and peep toe sandals. Here we have an inspirational look with details, prices and links! Lana Del Rey was seen leaving a Los Angeles nightclub,’ The Nice Guy’ on June 15th, 2016. Del Rey was wearing a White Visor, Knitted Sweater, Blue Jeans, and White Lace Shoes. Here is an inspirational look followed by details, links and prices! Lana Del Rey’s short film Tropico has many looks and outfits and here is one inspirational look. Del Rey was filming in June 30th, 2013 and was wearing a Blue Top, Denim shorts, Adidas, and Adidas Knee high Socks. Here is the inspirational look followed by details, links and prices! Lana Del Rey perfomed at the O2 Academy in Birmingham, UK on May 12th, 2013. 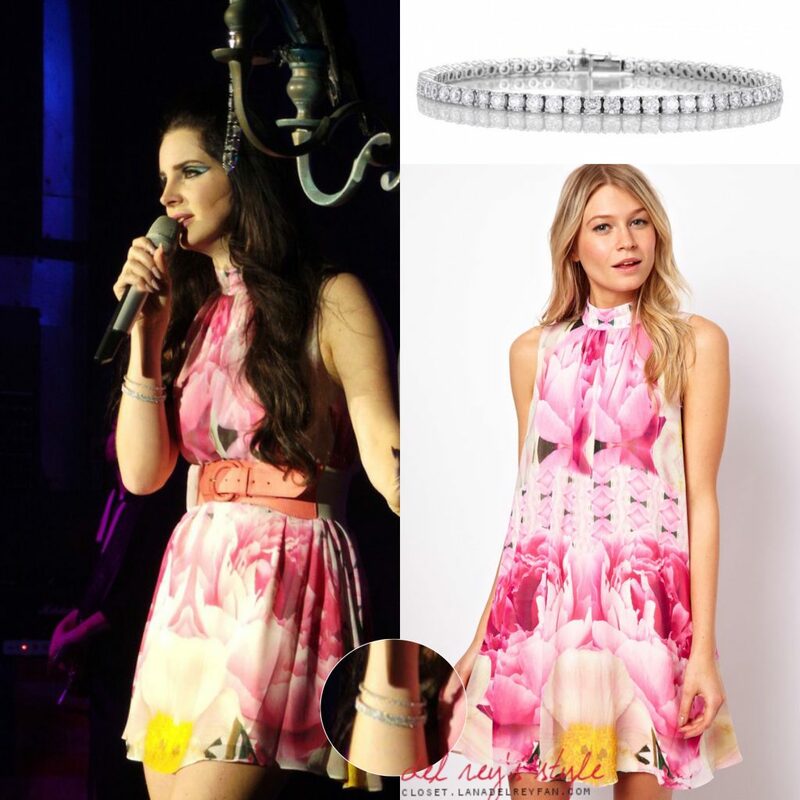 Del Rey wore a Floral Swing Dress followed by her 18k White Gold Eternity Line Bracelet. To Get The Look down below are details, prices and links! Lana Del Rey attended the Versace Fashion in Milan, Italy on February 22, 2013. The Fashion Show was for their fall / winter collection , and Del Rey wore Versace head to toe. She wore a Versace Lace Jacket, Versace Knee High Boots, and a Versace Black Clutch. Here we have the following items with details, links and prices. Lana Del Rey has done it all, from red carpets to magazine covers, her glamours style has made her fashion icon. Throughout the years Del Rey has brought a unique sense of style showing her hollywood glamour to even everyday looks. Here are some of Del Rey’s Most Stylish Moments Ever, followed along with links, prices and details! Lana Del Rey attended the 2012 Met Ball at the Metropolitan Museum of Art Costume Institute Gala in New York City on May 7th, 2012. Del Rey wore a Custom black-and-silver hand-embroidered gown, a silk Georgette Cape. along with dark make up and an Oxblood Lipstick. Lana Del Rey attended the 2012 Cannes Film Festival’s Opening Ceremony which was held at Palais des Festivals in Cannes, France on May 16th, 2012. Del Rey wore a Black Strapless Gown by Alberta Ferretti followed along with a Salvatore Ferragamo Edith Minaudiere. Lana Del Rey attended the opening ceremony of the 66th Cannes Film Festival at Palaid des Festivals along where they first displayed The Great Gatsby , which features Young and Beautiful. The festival took place in Cannes, France on May 16th 2013. Del Rey wore a Lena Hoschek Gown along with a her signature retro modern Makeup. Lana Del Rey attended a Charity Dinner at Grill Royal Restaurant In Berlin. Del Rey wore a Red Phoenix Dress made by Catherine Dean for the exclusive Pre-Fall 2013 Collection. This charity dinner took place in Berlin on March 20th, 2013. Lana Del Rey covered the L’Officiel Paris April Issue 2013 which was photographed by Nicole Nodland. Del Rey wore a Black Cut Dress and Bustier Dress , which were all apart of a limited edition 2013 Collection. Lana Del Rey covered Fashion Magazine for the Summer 2013 issue. Del Rey wore Bra Top and a Pink Tartan Skirt. Lana Del Rey attended the 72nd Annual Golden Globe Awards at The Beverly Hilton Hotel in Beverly Hills, California on January 11th, 2016. She was Nominated for her song Big Eyes, for the category of Best Original Song. 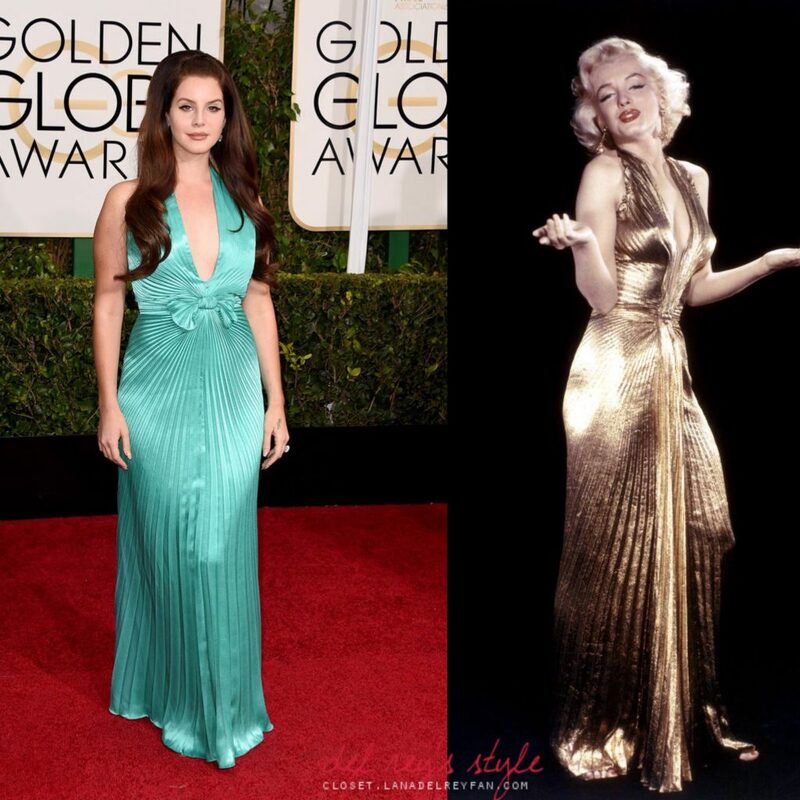 Del Rey channeled her inner Marilyn and truly paid tribute by wearing a Vintage Travilla Gown that demonstrated her love and inspiration for Marilyn Monroe. Lana Del Rey attended the 2016 Brit Awards where she was nominated for International Female Solo Artist. The award ceremony took place at the The O2 Arena in London, England on February 24, 2016. She wore an Embroidered Floral Dress along with some Marlowe Platform Sandals. Visit our post on The BRIT Awards 2016 for The Get The Look followed by an Inspired Look!